Dragons suffered defeat at the Liberty Stadium, despite leading at half-time as Ospreys sealed a bonus-point victory in the Guinness PRO14, writes Richard Early. Ceri Jones made eight changes from last time out, as Ross Moriarty, Aaron Wainwright and Leon Brown entered the starting fifteen, alongside Max Williams, who got a first PRO14 start for the 2018/19 campaign. A minute’s silence was observed prior to kick-off for Christchurch. The visitors hit back from Dan Evans’ opening try and Luke Price’s conversion to score through Rhodri Williams and levelled with a Jason Tovey two-pointer, before the fly-half’s penalty sent Dragons in front. As half-time approached, Hallam Amos’ try was converted and Price kicked three for Ospreys. After the break, Evans scored a second try and the conversion was missed, prior to Tovey’s penalty sending the away side five points in front. Shortly after, Evans sealed a hat-trick and then scored a fourth - both tries were converted, as Ospreys won. The hosts got off to a strong start and the Dragons defence stood resilient for five minutes, when lock Bradley Davies sent fellow forward Justin Tipuric over the line, although the try was ruled out for a forward pass. Two minutes later, Ospreys did have points on the board, as quick hands from centre Cory Allen allowed 30-year-old Evans to score from the right wing and fly-half Price converted. Dragons managed to withstand constant attacking pressure from the home side and after 19 minutes, scrum-half Williams intercepted inside his own 22-metre area, before speeding away from 29-year-old Tipuric to run almost the full distance and dive over the try line. Newport-born Tovey converted to level the scoring. Three minutes later, the home side had an opportunity to regain their lead from a penalty, although Price kicked wide from around 45 metres. With 27 minutes played, the visitors were awarded a penalty in front of the posts and Tovey’s effort was successful, giving his side a three-point advantage and he became the first Dragons player to reach the 1000th-point milestone. Jones’ team had the momentum and added to that shortly after as winger Amos crossed the line, scoring his 36th try for the region. The 24-year-old intercepted on the left wing and dashed behind the posts to give Tovey an easier conversion and it was successful. Tyler Morgan was forced off late in the first half with a shoulder injury and wing Dafydd Howells entered the fray so Dragons were forced to re-shuffle their back line. As half-time approached, Ospreys reduced the ten-point deficit to seven through Price’s 35-metre penalty kick. The Dragons were forced into a change again at half time as Hibbard was withdrawn with a hamstring injury and Rhys Lawrence came on. However, after the interval, the hosts got off to another powerful beginning and three minutes in, Allen passed to fullback Evans, who finished in the corner to secure a brace. Price missed the conversion and Ospreys went two points behind. With 46 minutes played, Dragons were awarded a penalty around the opposition’s 22-metre line and at an angle, Tovey kicked successfully and the visitors extended their lead to five points. It then took Evans a further seven minutes to secure a hat-trick as he went over from Price’s offload and the fly-half converted to send the hosts in front. Evans went on to seal a fourth try and a bonus point for his team by touching down in the left corner and substitute Sam Davies converted. Dragons continued to battle for a way back into the game, however no further opportunities arose and Ospreys took a bonus point victory at the Liberty Stadium. Ospreys: Dan Evans, Hanno Dirksen, Cory Allen, Owen Watkin (Aubrey 79’), Keelan Giles (Morgan 75’), Luke Price (Davies 55’), Aled Davies; Nicky Smith (Lay 65’), Scott Baldwin (Otten 65’), Tom Botha (Fia 55’), Adam Beard (Ashley 75’), Bradley Davies, Olly Cracknell (Cross 77’), Justin Tipuric, James King. 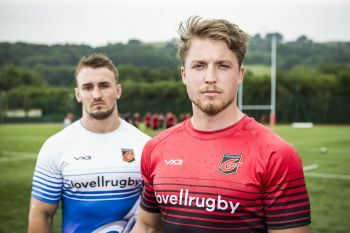 Dragons: Jordan Williams, Hallam Amos, Jared Rosser, Jarryd Sage, Tyler Morgan (Dafydd Howells 35), Jason Tovey (Lewis 66’), Rhodri Williams (Knoyle 66’); Brok Harris (Reynolds 75’), Richard Hibbard (Lawrence 41’), Leon Brown (Fairbrother 66’), Max Williams (Davies 56’), Matthew Screech, Aaron Wainwright, Taine Basham, Ross Moriarty (Greggains 78’).